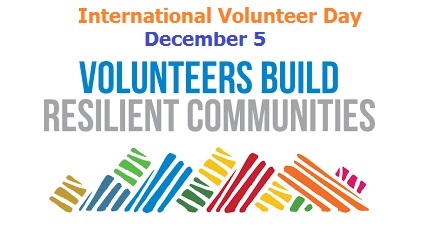 The International Volunteer Day for Economic and Social Development, more commonly referred to as International Volunteer Day, is an international observance mandated by the UN General Assembly in 1985. தொண்டு நிறுவனங்கள் மற்றும் தன்னார்வலர்ளின் பங்களிப்புகளைப் போற்றும் வகையில் ஆண்டுதோறும் டிசம்பர் 5 அன்று சர்வதேச தன்னார்வலர் தினம் (International Volunteer Day) கடைபிடிக்கப்படுகிறது. 2018 ஆம் ஆண்டிற்கான சர்வதேச தன்னார்வலர் தின மையக்கருத்து: "தன்னார்வலர்கள் உருவாக்கும் நெகிழ்திறன் சமூகங்கள்" (Volunteers build Resilient Communities) என்பதாகும். International Volunteer Day (IVD) 2018, “Volunteers build Resilient Communities”, recognizes volunteers worldwide – with a special focus on local community volunteers – who contribute to making their communities more resilient against natural disasters, economic stresses and political shocks. The campaign theme combines the recognition of volunteers with concrete evidence from the State of the World's Volunteerism Report (SWVR) 2018.